Planner posts are definitely a blogger favorite - it's a popular topic, there's plenty to talk about, and everyone has their own spin on the subject. 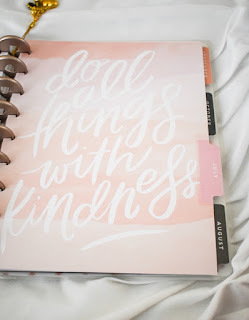 Since summer is typically the time for buying a new planner for the upcoming school year, I wanted to talk about the planner I've been using for 2017 (something different than my previous Vera Bradley + Lily Pulitzer agendas) and how my planner organization has evolved since the Super Cute Planner Organization post in 2015. I started using The Happy Planner by Me and My Big Ideas in January. I got mine from Michael's and I've seen them for sale in a few other crafts stores as well. 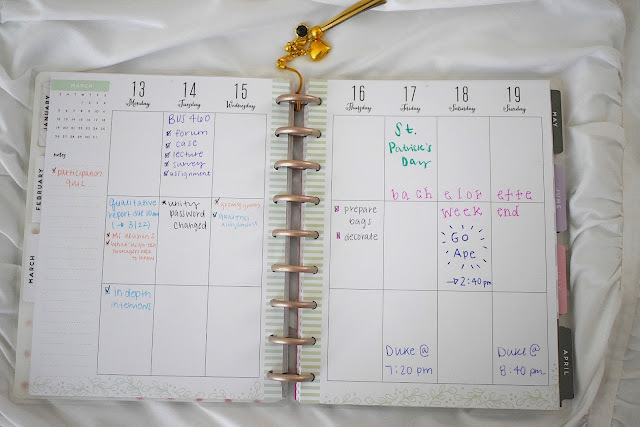 While this planner is not the cheapest option available, it's definitely less expensive than most other popular brands and I think it's a happy medium between a Lilly or Vera and a Day Designer or Erin Condren Life Planner. 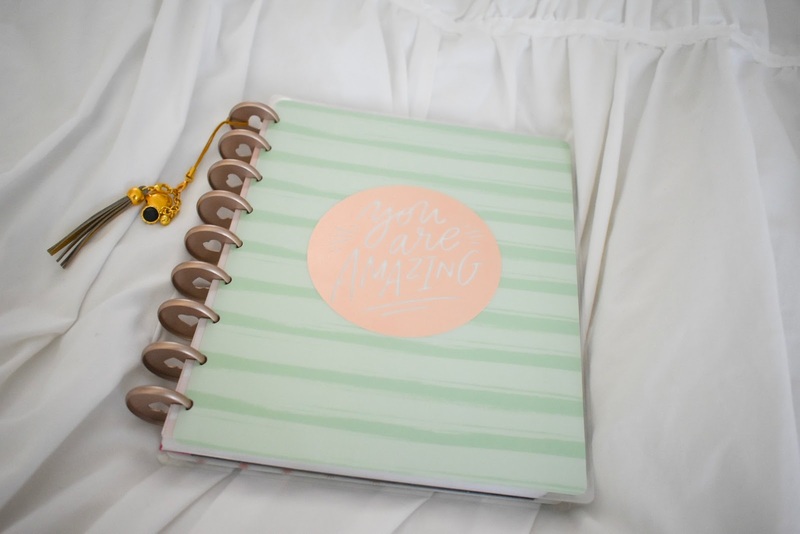 This planner comes in different styles and sizes, along with different cover options and page designs. I have the classic size with a vertical layout so each day is a column with three separate boxes. I typically use the top box for events, the middle box for a to-do list, and the bottom box for my posting schedule. 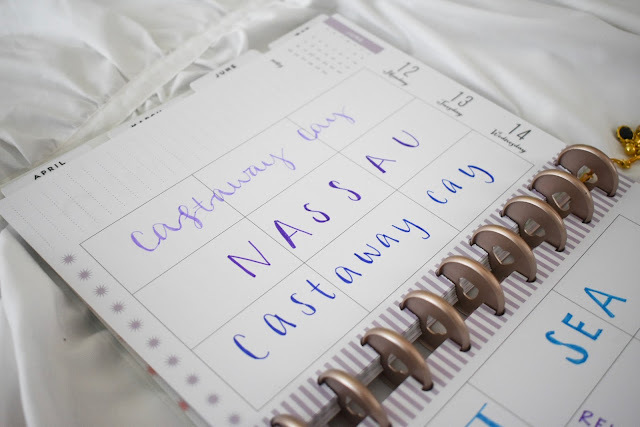 The layout is so flexible - you can use it any way you like and switch things around daily or weekly. Another nice feature is the notes section on the side of the weekly layout. If I have things to do but have no idea what day I might be able to do them, I write them in the notes to keep them in mind throughout the week. There's also a notes section on the side of the monthly layout so I use this in the same way for things that are taking place during the month with no exact day scheduled. One other thing I really love about this planner is the "Currently this Month" section before each month starts. Throughout the month, I can write in what I'm watching, where I've been going, and much more so that I can look back on this later in the year. Also on this page, there's a section for birthdays, important dates, and goals - plus the month, the month before, and the month after at a glance. 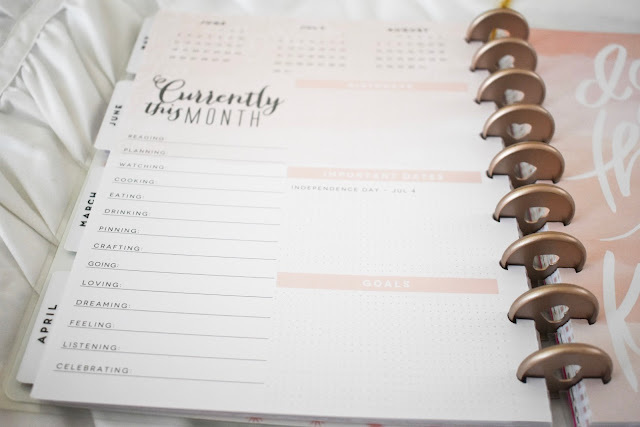 This page isn't the same in every Happy Planner so be sure to flip through them and make sure yours has a "Currently this Month" section if you're thinking about purchasing one. Like most planners, there's a monthly layout with small boxes for each day so I only write big events here, especially trips and tests or presentations for school. This is a good way to look at the month ahead, but I definitely prefer the weekly layout so I can see details for each day. One more thing I love about this planner are the boxes full of white space, instead of lined daily sections that I've had in previous planners. The space allows for so much more creativity - you can format things differently for emphasis, add doodles, and fill in blank spaces with quotes. 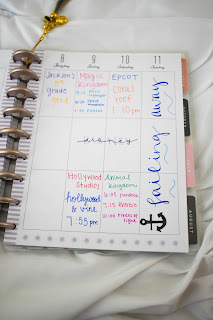 It's so much more fun than simple lines of to-do lists and due dates, but I do think that set-up is beneficial for students with tons of things to do. 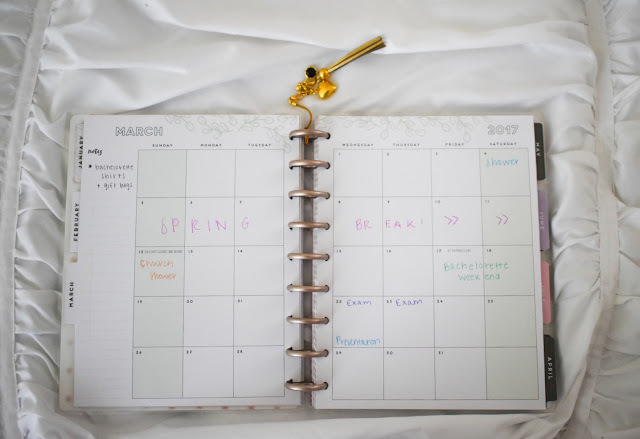 I think the Happy Planner is perfect for when you're transitioning out of college and searching for a post-grad planner, but aren't quite busy enough for a Day Designer. 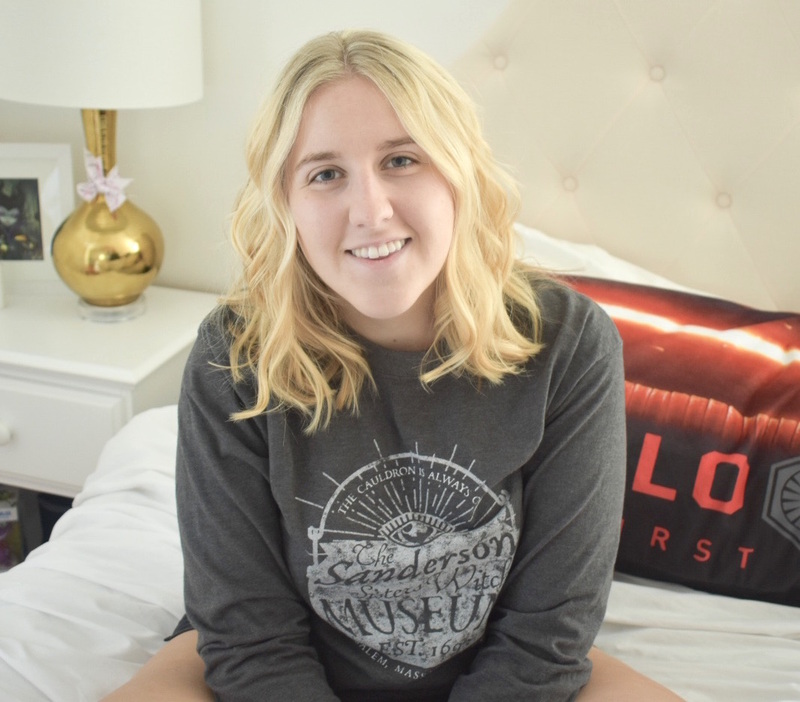 Let's talk accessories! 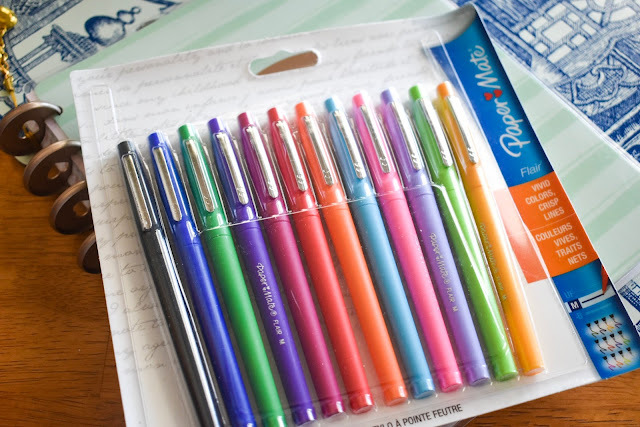 My favorite pens for writing in this planner are the Papermate Flair pens with a felt tip. I have a pack of 12 different colors that are great for color-coding and they don't bleed through the pages. Unlike regular ballpoint pens, these add bold color and thick lines that create a more put-together look. The Happy Planner brand has lots of accessories under the Create365 label, but some of my favorites are the large packs of stickers - perfect for holidays, events, or tracking fitness goals - and the add-on folders you can put in the front or back of your planner. The folder is great for holding onto loose pieces of paper you may want to save. One last tip I have that works for all planners is going back to add in important things you did during the day that weren't planned ahead of time. 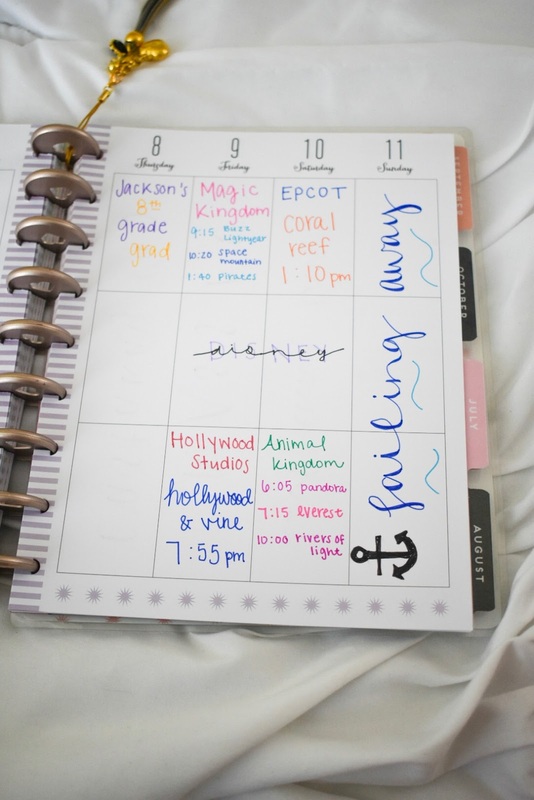 If you go somewhere fun on a whim, add that in to your planner so you can look back and remember that day. If you submit an order or receive a project grade, you can add that into your planner to create a record of what day it occurred in case you need that information in the future. It's important to use your planner as a combined agenda + journal so that you can write down all of your information - past, present, or future - and have all of that recorded in one place. What's your favorite planner brand + best tip for organizing it?